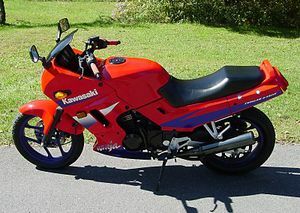 The Kawasaki EX250F is a motorcycle produced by Kawasaki from 1988 to 2007. 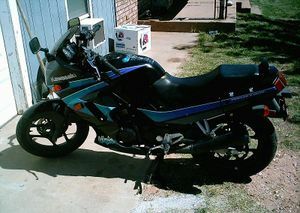 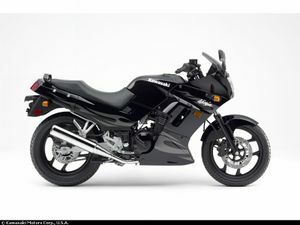 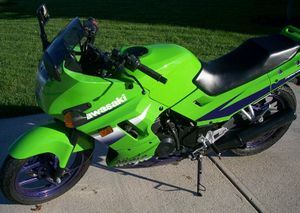 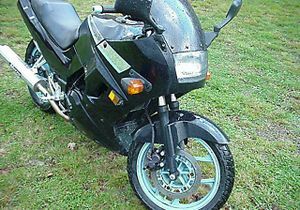 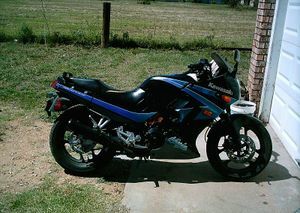 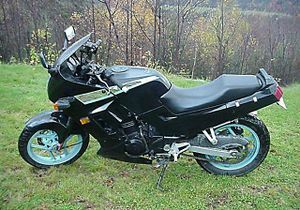 Known as the Ninja 250 in the US and the ZZR 250 in other export countries. 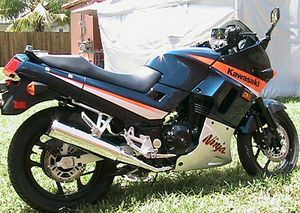 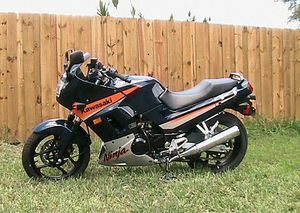 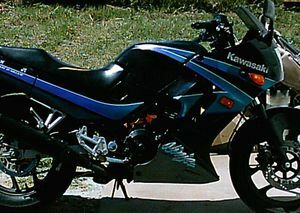 The Kawasaki Ninja 250R (also known as the EX250 in the U.S., and GPX250 elsewhere in the world) is a long standing model in Kawasaki's lineup, introduced in 1986 and continuing in production as of 2006. 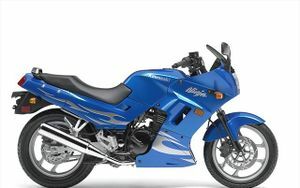 The 2006 model has an MSRP of $2,999 USD. 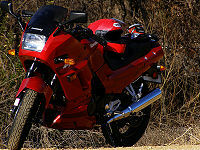 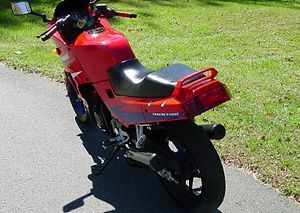 The 250R is marketed as an entry level sport motorcycle intended for normal use on paved roads. 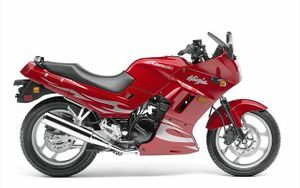 Compared to present industry designs, the 250R is more a "sporty-standard" motorcycle with a fairing than a true sportbike (considering its ergonomics, chassis design, and engine placement within the frame), but it is still an excellent sport machine. 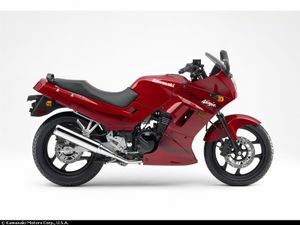 The 250R is light for a motorcycle, weighing just over 300 lb (135 kg) dry. 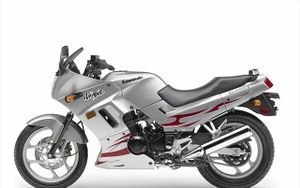 Its 250 cc displacement, counterbalanced, water cooled four stroke engine is smooth for a twin-cylinder, and though not exceptionally powerful with 36 hp (27 kW) at best, it can easily maintain speeds in excess of 80 mph (130 km/h) while consuming fuel (87 octane) at 55 to 75 miles per gallon US (22 to 30 km/L) from its 4.8 US gallon (18 L) tank, and has a top speed of about 100 mph (160 km/h). 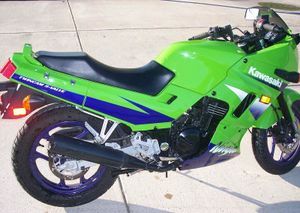 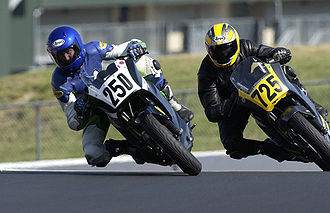 The Ninja 250 faces very little direct competition within its class inside the United States. 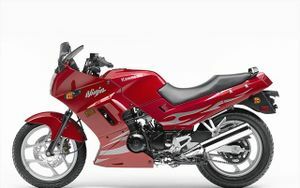 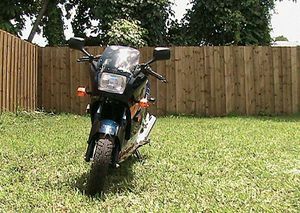 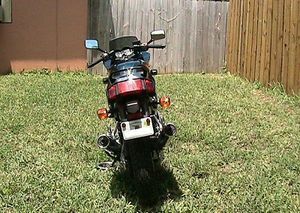 The main competitors are the other 250cc "beginner bikes" priced around $3,000, namely Honda's Rebel 250 and Nighthawk 250, the Suzuki GZ250, and the Yamaha Virago 250. With the exception of the Nighthawk (a standard), these bikes are all cruisers. 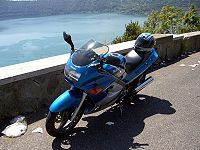 The disparity in style between a crusier, a standard, and a sportbike is frequently the buyer's deciding factor, given that one's choice in bike is often as much about self-image as objective features. 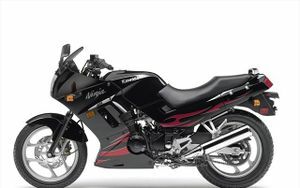 None of these bikes can match the Ninja 250's much greater power, 14,000 rpm redline, 6-speed gearbox, tachometer, and centerstand, nor do they offer both front and rear disc brakes. 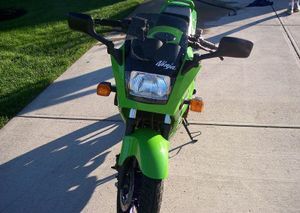 All of them have an advantage over the stock Ninja with their rear suspension preload adjustability, although the Kawasaki "Uni-Trak®" system is more advanced and may be upgraded. 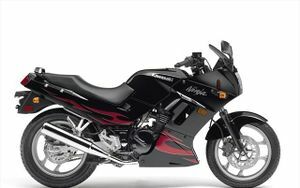 The cruisers also offer relatively low seat heights in the 26-27 inch range, an issue for some riders. 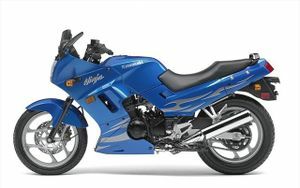 None of these US models, including the Ninja, have changed much in recent years, but outside the United States there are many exciting advances in small-displacement, lightweight, and/or low-cost motorcycles, including several four-cylinder, sixteen-valve 250's. 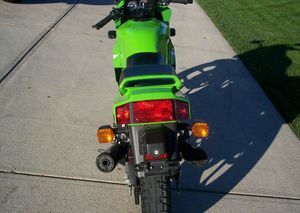 That being said, the Ninja 250 enjoys a modest following among riders who appreciate its light weight and nimble handling as an amusing "track bike". 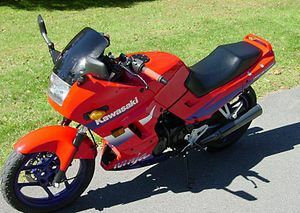 The very fact that it hasn't changed much since 1988 means parts are plentiful and inexpensive. 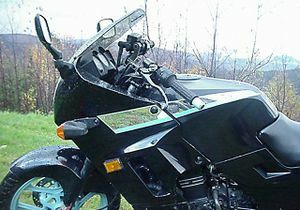 EX250-E: model sold in the from 1986 to 1987. 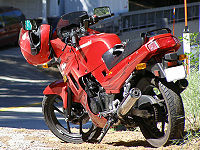 EX250-F: model sold in the USA and Australia from 1988 to present. 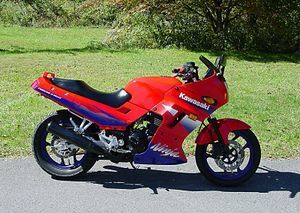 Sold from 1988 to 1990 in other parts of the world. 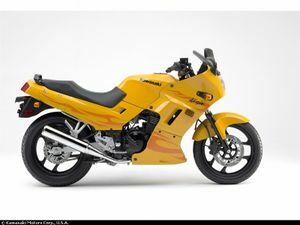 Changes in bodywork, wheels, suspension, electricals and some engine specifics from the E model. 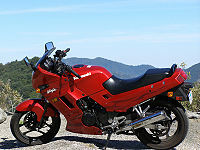 EX250-H: sold primarily outside of the USA and Canada since 1991; Canada received this model in 2000, while the U.S. still has the F model. 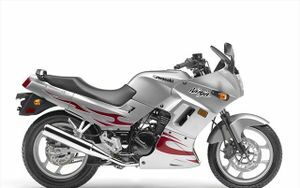 Major rework including frame, wheels, suspension and electricals; same engine as the F model. 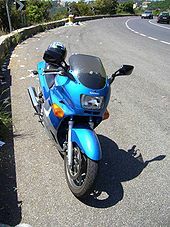 Known largely as the ZZR-250. 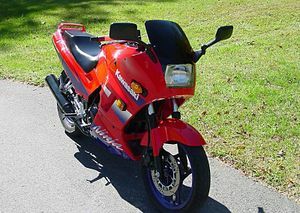 This page was last edited on 24 December 2018, at 17:00.